Teach if/else logic and basic screen interactions with this coding concept box! Each box includes 10 sets of 10 supercards (100 total cards! 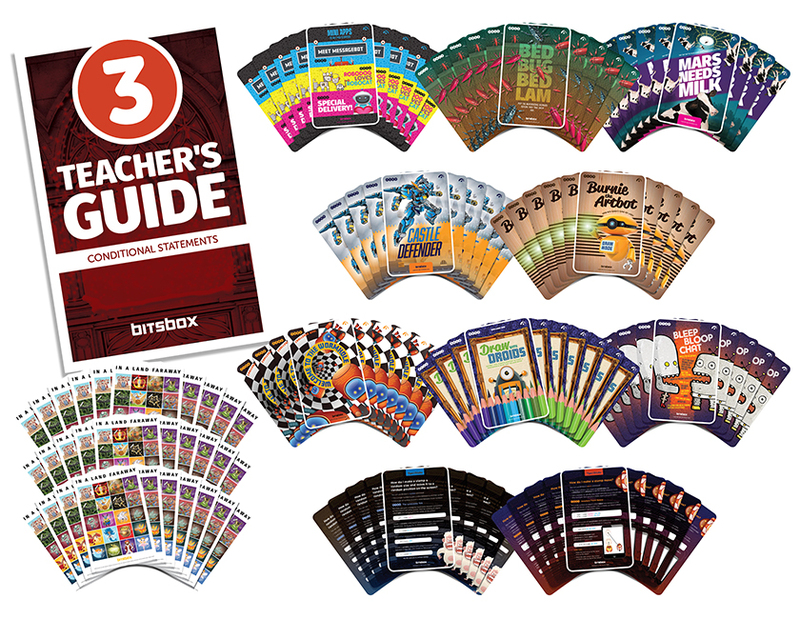 ), 30 sheets of fun stickers, and a Teacher's Guide. Perfect for classrooms, scout troops, homeschool groups, and after school programs! Classroom boxes build on each other over time, introducing more complicated coding projects and coding commands as you go. We recommend starting with Box 1: Coordinates and Basic Commands and Box 2: Variables and Movement Commands. The projects inside this fairy tale-themed box provide practice using if/else logic and the tap and drag functions to create interactive apps. The Teacher’s Guide explains the use of if/else logic and the Bitsbox tap and drag commands. There’s also a glossary for each coding project detailing project complexity, coding concepts included, instructions on how to use the app, suggestions to alter the app, and a URL to see the app in action. Bling this Thing: Tap to add priceless jewels to anything! Frog Prince Donkey: Turn a frog into a prince. But watch out—tapping wrong gets you a donkey! What Does the Troll Say? : Whatever you want him to! Flight of the Dragon: Fly an awesome animated dragon! Touch the screen to make him turn! Watch as he leaves a path of fire! Cookiesnitch: Catch as many cookiesnitches as you can without catching a vampire bat! 333 Little Pigs: What’s better than 3 little pigs? Flushioso Wandini: Wave your wand to make the gold appear! How do I change to a random fill every time I tap the screen? How do I make a rubber chicken follow my cursor when I drag? How do I make a stamp change depending on where it is?